That all seems sound enough. But surely an important factor has been the fall in the Euro exchange-rate versus sterling and the dollar? That matters a lot for Ireland whereas Greece (I assume) doesn't export much to the UK. I'd guess that looking at competitiveness in terms of a real-exchange-rate index, rather than wages, would highlight what has gone right for Ireland. Another thing, which I think needs to be borne in mind in all these discussions, is the drastic regime-change associated with Draghi replacing Trichet at the ECB. As one who was looking very nervously at my modest holding of Irish government bonds, the "whatever it takes" speech stands out as a very significant event. It clearly meant that Ireland wasn't going to be left in the manure; Greece, not so much. UCD's Aidan Regan reckons that improvement in wage competitiveness has basically nothing to do with Ireland's sort of recovery from the GFC. Wages went up in crucial export sectors. So the "success story" of austerity in Ireland is a convenient lie for Euro elites which Ireland's right wing EPP aligned government has been only too happy to play along with. 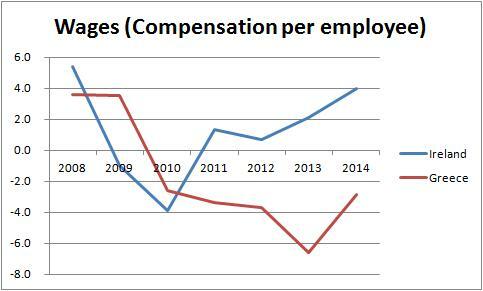 My understanding is that wages in the State sector also went up. Is this the case? What Really Explains the Irish Economic Recovery? The Irish example has been so successful that 10% of the country's population has emigrated since 2008. This is another wonder of the eurozone and the policies of the EC, EU and ECB. Latvia, too - another supposed success story - counts people among its largest exports. The movement of people, by volition is one thing, the wholesale movement of the unemployed by necessity is indicative of something else. There is colossal economic incompetence in the EU, casual indifference to people and their plight, a tendency to try and subvert truth to fit ideology and a hubristic overarching enterprise (the EC) which believes that it has no need of compromise or consent. Who really wants to live in a European Union where popular sovereignty, is and can only be, secondary to the interests of corporations. TTIP, is a case in point, the EU wants to put it through despite its obvious threat to self-determination. Allowing bodies which are unaccountable, unrepresentative and un-elected to wield such power - i.e. to operate as de facto states within states - is clearly not in the interests of Europe's citizens. "you can't be a member of a currency union and see (forced) migration as a bad thing" is the kind of thing a slaver would say. Migration has strong costs to the migrant. Or do you think that surgery is not a bad thing because you're covered by healthcare? Paul Krugman on Puerto Rico: "large-scale emigration — which is actually supposed to happen when changing economic winds cause a U.S. region to lose competitive advantage." You are right. As Habermas said recently in the Guardian, the EU is very much a neo-liberal enterprise. It's all about free movement of capital, goods and labour. Lookup economic theory on a currency union (optimum currency area). (1) LABOR MOBILITY, (2) capital mobility and prices and wages flexibility (3) fiscal transfers and (4) countries should experience similar business cycles. At the moment the EU tilts to the neo-liberal. But if it is ever lucky enough to get Brexit, that will change. So repeat after me: pray for Brexit. Simon, it appears that another part of the explanation is that a significant part of non-tourism Greek exports are refined energy products, priced in USD and for which Greece is of course price taker. What matters for Greek GDP and employment is the value-added in the Greek part of the refining process. A fall in Greek costs should imply more of the refining switched to Greece. The exception for the Euro value of Greek GDP would be if the demand for refining were price (in this case cost) inelastic. I do not know enough about the market for for refining to guess price elastiicity. Almar. "The OECD estimates that growth in 2014 was nearly 5%, and this was greatly helped by a 12% increase in the volume of exports. " What if every nation in the world introduces austerity? 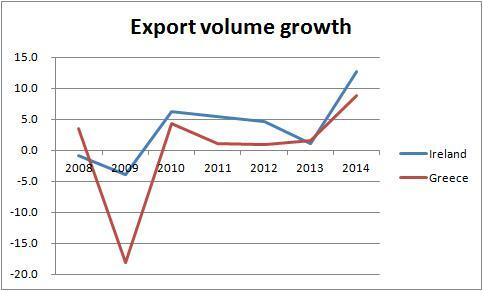 No export growth there! Besides there is a better solution, if you want export growth exit the damn euro. As SW-L rightly suggests, extra taxes on the tourist industry in Greece is not a brilliant idea. By the same token, what would help would be import taxes or tariffs as suggested by Heiner Flassbeck (link below). Of course that runs counter to the whole idea of the EU. But desperate times call for desperate measures. I suggest that the cost of a thousand extra bureaucrats implementing those tariffs (if a thousand is about the right figure) would be small cost compared to the misery currently being imposed on hundreds of thousands in Greece. In per capita Spain(0,062$) has it worse than Greece(0.098$), Ireland(3.54$) is basking in money. I don't have any idea what are you talking about with these "per capita". I mean that there is a great difference between Greece ant others in direct investment inflows. I think that this is a very important concept. "In spite of the large fall in wages, the rapid increase in energy costs meant that exports of these commodities, price takers on the international market, plummeted….."
This is what people have tried to tell you in your comments for years. You have to consider the Marshall-Lerner conditions. Devaluation, like before the Euro Drachma economy, is not a panacea for Greek problems - it depends on how open an economy is and its trade and industrial structure. It could even make the situation even worse. This is why you should not rely on standard neo-classical theory alone. Devaluation may not work in that it brings no increased export earnings. But it does make imports more expensive for Greeks, which cuts their standard of living. As long as they accept a big enough cut for that reason, then devaluation, if it goes far enough, must work at some stage. I.e. strikes me that neo classical theory is right. Or perhaps I’ve missed something. Greek imports will rise in prices very steeply, but they are non-substitutable by domestic production, but essential for production (and consumption). This will include prices for inputs of the very exports it produces - this could wipe out any favourable price effect from the devaluation on the price of those exports. As Greek imports are price inelastic (and they will now be more expensive as they have to purchased in a devalued currency), and with little price advantage in exports from the devaluation, the odds are the balance of payments will deteriorate. Now I am assuming that Greek debt is written off. If it is isn't - add the cost of paying off that debt in a devalued currency. People counter this by pointing out tourism, but chances are that is not going to be enough. Two things you need to understand (1) the structure of the Greek economy and its trade and (2) the Marshall-Lerner condition. I ask all to try and take into consideration both - and do not RELY on neo-classical theory - ie the Mundell Flemming Model (refer to it by all means, but do not rely on it). "This will include prices for inputs of the very exports it produces - this could wipe out any favourable price effect from the devaluation on the price of those exports"
In fact, the article mentions a very similar effect, that of increased levies on energy imports. These are non-substitutable, and the result argued in the article is that despite the fall in wages, Greek exporting sectors have remained uncompetitive. That's an "institutionalist" point of view and one in which the trade balance, not just the government balance, matters. That's not what Economists discuss. Our blogger is a salesman of "standard neo-classical theory" but not "alone", it is standard neo-classical theory plus frictions, and even then it gets misapplied to outliers and special cases like Ireland and Greece that have been subjected to large positive shocks (huge cheap capital inflows) which then have ended. For example in our blogger's approach what matters is the government account, but the trade account is hardly relevant, because rational expectations affect private interests, so their level of private debt is always rational and thus does not matter, but do not affect government decisions, so government debt matters. * A large complex developed economy hums along with 2% real growth of production (GDP), 2% inflation, 2% government deficit, 5% unemployment. * For whatever *arbitrary* reason private *demand* is the first to stop growing at 2%, and begins growing less slowly or stagnates or even contracts. * This leads to lower production, which leads to lower income, and this to lower demand, and eventually a new state in which there is a *general* glut that is both capital and labour are unemployed in nearly all sectors. * The obvious solution is to counteract the original *arbitrary* fall in private demand with an increase in *public* demand, other things being equal, that is with an increased in government borrowing. The higher government borrowing will be easily reabsorbed once capital and labour are fully employed again. * "austerity" is the attempt of the government to maintain the deficit target by contracting public demand along with contracting private demand. RBC people think that is the correct response because there is never an *arbitrary* fall in demand in an economy where everybody behaves according to rational expectations in perfectly competitive markets. The "story" above depends critically on things being "normal" at some point, and events being initiated by *arbitrary* fall in demand. I have deep sympathy for the Greek people. Good article in the New Yorker about them today. The problem isn't primarily debt. Or even austerity though that is very harmful. Even if if Greece could devalue they would still have problems. When the PM has to promise to deregulate gyms and bakeries can only sell bread in mandated weight you have sclerotic economy . A crisis can be an opportunity , or as Homer S said a crisitunity. If the EU gave one bleep about they would have proposed a deal that required Greece to undergo massive reforms in exchange for restructuring debt repayment. I'm no expert on the reforms but John Galbraith Jr would be a start. The larger question is obvious. What the ._._ is the Eurozone? It reminds of the US when we had the Articles of Confederation , a house of cards that collapsed. Bottom line, Europe needs to big or go home. Every setback will poison the zone. Politically you're correct, EU institutions are quite closer to a Confederation than a Federation and fail for very similar reason : each Stats want others to act for its exclusive benefit. No surprise then that acrimony in EU echoes the prevaling one in CSA by end of war. My view on this Here is one thing which makes a big difference. Interest cost. Greece has about 50% more debt than Ireland, as %age of GDP. Let us assume 2% interest rate. Let us assume 150% debt /GDP for Greece, 100% for Ireland, just to make calculations easier. Let us further assume all finance of Greece is from foreign lenders. So 2% interest means 3% leaves economy each year, given that 150% debt to GDP ratio. Let us further assume that lots of Irish debt did not cost them anything, as lots of ELA lending where state-owned banks financed the state. 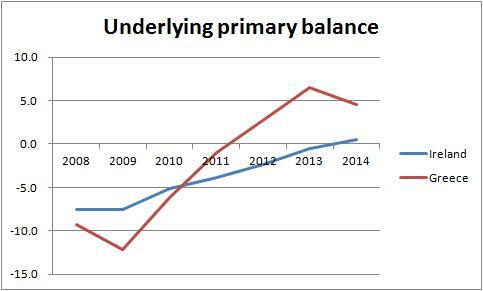 So cost of borrowing money for Ireland is NIL. 2% interest is paid to state owned banks. That is, of course oversimplification, but if 3% leaves the country in interest payments in Greece, and Ireland borrows for free, then that goes a long way to explain difference. 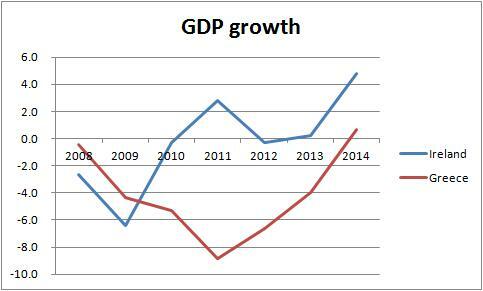 Over 5 years 15% GDP difference! It would take a while to figure out what exactly was happening, but there will be significant impact from these debt issues. The trend is right. "To sum up, the main reason Greece has suffered so much more than Ireland is that the amount of austerity imposed on Greece has been much greater." I'm always a little concerned by the use of the term "imposed". Austerity in Greece is a result of the collapse of the Greek economy, the collapse of government revenues, and the inability of the Greek government to borrow in the markets - all three of which are of course inter-related. Bailout lending has softened the impact of that austerity, but the use of the term "imposed" ineluctably associates the occurrence of austerity with the bailout lenders. To promote that association is to promote the idea that Greece is somehow owed a complete avoidance of any of the consequences of its own economic mismanagement and failure to reform. It's a bit like blaming the medical profession for the lung cancer you got from years of smoking. Greece's creditors forced it to rein in government spending savagely as a bailout condition. This like an oncologist having a lung cancer patient take powerful chemotherapy drugs designed to cure the cancer, except these drugs destroy the patient's immune system which eventually leads to the patient's demise. "Imposed" in the sense that a) there could/should be less austere terms required as conditions for bailout financing, and b) Greece's preference [if we can anthropomorphize a nation] would be for said less austere terms. Yes, Greece has to reform (one way, or another). But, Greece wasn't the only party to its [original] debt pile-up. If we are to insist on Calvinistic morality plays, the tale must include the moral hazard of the bankers (who lent on the false/stupid assumption that a Euro member government couldn't default... and were not only bailed out, but now are rewarded with to-be-privatized public assets at fire sale prices). "Forced" and "as a bailout condition" is a contradiction in terms. Could the greek government legitimately refuse the bailout? As the > 60% vote for NO the answer is certainly positive. Unless you wan to argue that Tsipras and Tsakalotos were physically threatened with harm unless they signed. That is not "imposed", that's *offered*. The greek government was offered terms, and accepted them without any imposition. The greek government always had and still has the alternative of finding better terms, someone willing to give the greek government much larger loans with even softer conditions so that the greek government could fund larger deficits with those loans. Because what SimonWL and you two want is bigger loans to fund a bigger greek government deficit (or equivalently a smaller or negative greek government primary surplus). The "non-austerity" argument is that once Greece got used to enjoy imports of 15-20% of GDP paid for by huge government deficits funded by loans, those loans should be turned into permanent fiscal transfers of 15-20% of GDP to the greek government to fund the continuation of the level of imports that Greece has now a vested right to enjoy. Ireland is deeply integrated into the UK and US economies and has benefitted from their recovery and is the European base for blue chip companies such as Google, Microsoft, Johnson & Johnson, Dell etc. There is nothing even remotely comparable in Greece. Ireland also is a English speaking country in which government and institutions operate, largely free of corruption, within a British common law framework. I don't know if this has been mentioned by other commenters, since I haven't read all their links, but 1) in the case of Ireland, that country has long pursued what can only be called a corporate tax predation policy and receives a large amount of FDI. Further, much of it is in IT services with the likes of Google and Microsoft, which is a high value-added export with high-paying jobs, where wage-costs are only a minor factor, and IT services are currently a booming sector globally. (Finland, by contrast, has a concentration in IT hardware, which is a declining sector globally and its economy is mired in recession). 2) With respect to Greece, its banking and credit system have been badly impaired, (now catastrophically so with the capital controls and bank closures), so likely the credit for expanding potentially promising export sectors has been missing or difficult to obtain, (since the banks are loaded with NPLs and everyone is in arrears to everyone else). That might go some way toward explaining the lack of export performance improvement, even given the size of the "internal" devaluation. I suppose these figures may well be skewed by the fact that, in the six years following the onset of the crisis in 2008, nearly 10% of Ireland's population chose to emigrate. Choice in this instance being a very relative concept. The problem is simply the proportion of the economy that's made up of internationally tradable vs. non-tradable goods and services. The majority of Greeks work in the non-tradable sector: dentists, lawyers, accountants, taxi drivers, coffee shops, bakeries, builders, etc. However hard they work, and they work very hard and very competitively, they sell very few services to visitors and they don't export goods. They can only earn a Euro from another Greek. But all these people aspire to consume imports. It's up to the minority who engage in tradable activities such as tourism, ores, and food exports to earn Euros from outside and bring them to Greece. As soon as they spend the money in the domestic economy it circulates for a bit and then leaves to pay for someone's imports. Notice that nobody has to be inefficient or otherwise inept to make Greece poor. Simply an unbalanced export vs. domestic sector is enough to guarantee a trade deficit. That is, as long as a hared currency allows domestic traders to consume imports. Returning to drachma would fix the problem by making imports expensive (the effect on exports would be negligible). - Cultural barriers, language, etc. - Cultural short-sightedness. Seeing the market as Greece. - Remote from trading partners. - Lack of large-scale capitalism. Distrust of it. - Bureaucracy of starting a business. - Tax, regulatory, etc. annoyances. - Distrust from outsiders to Greece (no-one buys Greek). - Victimisation on trust (who would buy from us?). Fixing these problems takes more than austerity or attacking already adversarial labour relations. Only a couple relate to government regulations or functions. An intelligent debate and action on how to make Greece's economy outward facing, as opposed to neoliberal "open" would go a long way. And it's worth asking if Greeks really want an outward facing economy or domestic security under the relative protection of the drachma. "Fixing these problems takes more than austerity or attacking already adversarial labour relations. " I suspect so Pavlos. Thanks an informative post and it was great to the get a Greek perspective. Comparative geography must come into the export story. Ireland is off NW Europe: large, rich economies doing sort of okay. Greece's trade neighbours in the EEA are Italy and the Balkans, doing much less well. Turkey is thriving but there are non-tariff barriers to trade (drawn daggers). Ireland also has a number of "natural" advantages over Greece. 4. A lot of its industry is newer and more "flexible"
Turning around Greece was always going to be harder than Ireland. * There is a large difference between irish GDP and GNP because of the status of Ireland as a tax evasion facilitator. * Irish exports are also strongly influenced by that special Irish aspect. * Greece has had one of the biggest multi-year import surges recorded fueled by borrowing. * Ireland has has an amazing capital gains bubble fueled by borrowing over several years, a rather different thing from the greek import surge. * Both Greece and Ireland have large black or grey economies, and the greek one is much bigger with far more local tax evasion. * The irish public service is somewhat corrupt, but it is far less corrupt and inefficient than the greek public services. * The statistics of Ireland are far more reliable than those of Greece, who have been systematically faked in large ways for many years. To use these two quite special (Ireland) and very special (Greece) cases and to compare them in particular as to "austerity" over a few especially special years seems quite misleading. If the slope of the Phillips curve is similar in both countries, how is Greece worse off? Wouldn't its Phillips curve be steeper since its economy is less open compared to Ireland, which would make it more worse off since it is more sensitive to demand conditions?